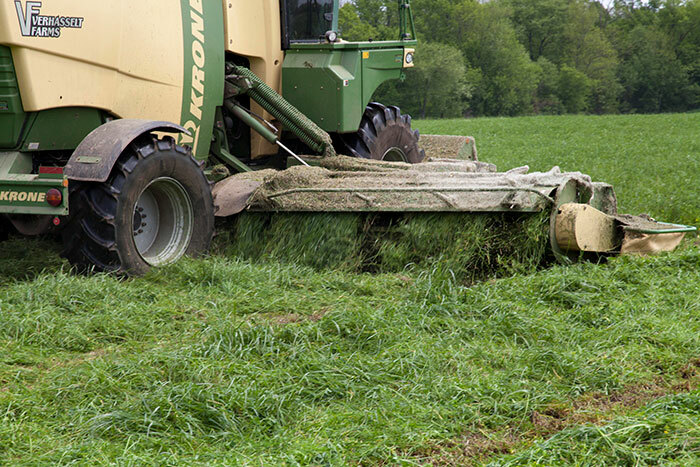 Within the United States, only 10 percent of alfalfa stands are seeded with a forage grass. “That’s hard for us in the Northeast to believe because in the Northeast about 85 percent of the alfalfa is seeded with forage grass,” said Ev Thomas. Thomas, president of Oak Point Agronomics, addressed the obstacles and opportunities of alfalfa-grass in a presentation at the 2018 Four State Dairy Nutrition and Management Conference held in Dubuque, Iowa. In the Northeast, the soil is more favorable for alfalfa-grass with its variability in drainage, pH, and fertility. The colder winters also have more of an effect on alfalfa than grass. But, perhaps what’s more important is when comparing alfalfa to alfalfa-grass, it is clear that alfalfa-grass is nutritionally superior. A study completed by the University of Wisconsin-Madison in 2012 compared a total mixed ration (TMR) that included alfalfa to a TMR that included alfalfa-grass. Cows that were fed the alfalfa-grass TMR produced an average of 5 pounds more milk than the cows fed the TMR with just alfalfa. Alfalfa has a taproot, which is also where it stores its nutrients. Meanwhile, grasses have a dense, shallow root system that is highly efficient at nutrient uptake. “Once grass is well established, trying to sneak any nutrient past it is like trying to sneak a lamb chop past a wolf,” explained Thomas. Because of its shallow root system, grasses store their nutrients in the bottom 3 to 4 inches of the above-ground stem. So while a 2-inch mowing height won’t have an effect on alfalfa, it can kill grass in a seeding year and reduce growth in other years. Thomas also warned to be careful with timing because the digestibility of grass declines twice as fast as alfalfa. Another benefit of alfalfa-grass is that it almost always yields more than alfalfa stands in both seeding and established years. However, Thomas warned that the most difficult challenge with getting a precise alfalfa-grass was not the seeding rate but the initial stand. He explained that a combination of two-thirds alfalfa and one-third grass is the ideal alfalfa-grass stand. The moisture conditions of the soil immediately following seeding also have a heavy influence on the percentage of grass in the stand as well. Thomas stated that if the conditions are ideal for seeding grass, reduce the recommended seeding rate by a third. “I would be more concerned about having too much grass in the seeding than not enough,” Thomas explained. Thomas also warned to not seed grass when the potassium soil test is low or medium-low. The alfalfa may grow well in the beginning, but only until the grass root system becomes established due to its high nutrient uptake. When it comes to selecting which species to include with alfalfa, meadow fescue is the clear choice. While meadow fescue doesn’t yield as high as tall fescue when seeded as a pure stand, it out produces tall fescue when seeded with alfalfa. Meadow fescue also has a 10 percent higher digestibility than all other grasses, including orchardgrass and timothy, at every stage from early-boot through bloom. This was discovered in a study completed by Cornell University. Kassidy Buse is serving as the 2018 Hay & Forage Grower summer editorial intern. She is from Bridgewater, S.D., and recently graduated from Iowa State University with a degree in animal science. Buse will be attending the University of Nebraska-Lincoln to pursue a master’s degree in ruminant nutrition this fall.